Last Sunday, 6 December was the second Sunday of Advent, which reminds us of the weeks leading up to the birth of Jesus on Christmas Day. During Advent, we are challenged to reflect on our thoughts, what Jesus asks of us, and how we can help our neighbours. We reflect on our actions and outreach towards others and through our actions, we show others who Christ really is. “Alleluia, alleluia! The Spirit of the Lord is upon me; he sent me to bring Good News to the poor. Alleluia! 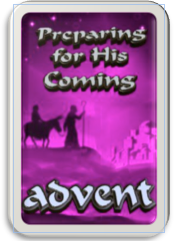 This coming Sunday is the Third Sunday of Advent. The Third Sunday of Advent is traditionally called Gaudete Sunday. Gaudete is the Latin word meaning “rejoice.” This Sunday is so named because “Rejoice” is the first word in the entrance antiphon for today's Mass taken from Philippians 4:4,5: “Rejoice in the Lord always; again I say, rejoice. At the end of the year we also celebrate all we have achieved as individuals, teams and a school community. We have shared many opportunities and achievements during the year, of which we can be very proud. These achievements include: our School Concert, Jump Rope for Heart, Maths Relay, Orienteering, Mini Vinnies Fashion Parade, Parents and Friends Quiz Night, Grade 6 Concert, Milo Cricket, with the Grade 5/6 Corpus Christi Girls Team, winning the final in Tasmania. The girls travelled to Melbourne on Wednesday 9 December to participate in the Finals at the MCG today Thursday 10 December. Congratulations to the team: Maddison Mills, Maddison Brooks, Olivia Read, Ella Marsh, Melodie Armstrong, Chelsea Thomas, Amelia McMahon, Dana Hyland and Taylor Brooks. On Thursday, 12 November, twenty-one Corpus Christi students from Grades 3 to 6 attended an Indonesian oral language competition at the University of Tasmania. They competed with students from several other state and independent schools who also study Indonesian. In addition to performing a poetry recital in Indonesian, and completing a listening comprehension task, the students also enjoyed the opportunity to participate in a self-guided tour of the University’s facilities including, lecture theatres, tutorial rooms and open spaces. The results of the competition were announced in three categories: poetry, listening and overall. The overall category was calculated by adding the scores achieved in both the poetry and the listening areas. There were a number of equal place-getters, but below is an outline of how Corpus Christi students were placed in the final analysis. Certificates and prizes will be handed out at this year’s final assembly. The Corpus Christi End of Year Assembly is on Monday 14 December commencing at 11:30am in the hall. The Grade 6 Leavers Dinner and Disco will be held at Nate’s in Cambridge this year on Monday 14 December. On Tuesday 15 December, Grade 6 students will have their Big Day Out, Surfing at Clifton Beach. On Thursday 17 December we will have our End of Year Thanksgiving Mass and Grade 6 Leavers & Award Ceremony commencing at 9:30am in Corpus Christi Church. Mass is followed by morning tea in the hall for Grade 6 students and their family. Grade 6 students will leave school with their parents at the conclusion of morning tea. I wish all families leaving Corpus Christi Catholic School this year, all the very best for the future and thank you for the valuable contributions you have made to our school during your time with us. We farewell Mr Tim Harrington, who is moving to St Aloysius to teach Grade 5 and thank him for the great work he has done at Corpus Christi during his five and a half years at our school, as class teacher and teacher of Indonesian. We also farewell Miss Danielle Middleton, who is moving to Holy Rosary Catholic School to teach in 2016, and thank her for the contributions she has given to our school this year. We wish Tim and Danielle all the very best at their new schools and in to the future. We farewell Mrs Anne Simpson who is retiring, after 42 years of teaching, and looking forward to relaxing, spending time with family and friends and some travel. We thank Anne for her wonderful contributions to Corpus Christi Catholic School and to Catholic Education, and wish her well for all she does in the future. Many thanks to Kieran Gill for the great work he has done this year in Learning Support with students, and to Jodi Jones and Peter Gardiner for their contributions during Term 4. I thank all staff and students for their hard work, support and commitment during the year, also Father Peter O’Loughlin, the School Advisory Board and the Parents and Friends Committee for their support and contributions to our school community during 2015. Thank you to the Parents and Friends for paying for the Grade 6 students Leavers Dinner as a farewell gift to them, as they leave Corpus Christi and move to high school. The students and parents appreciate your thoughtfulness and generosity. 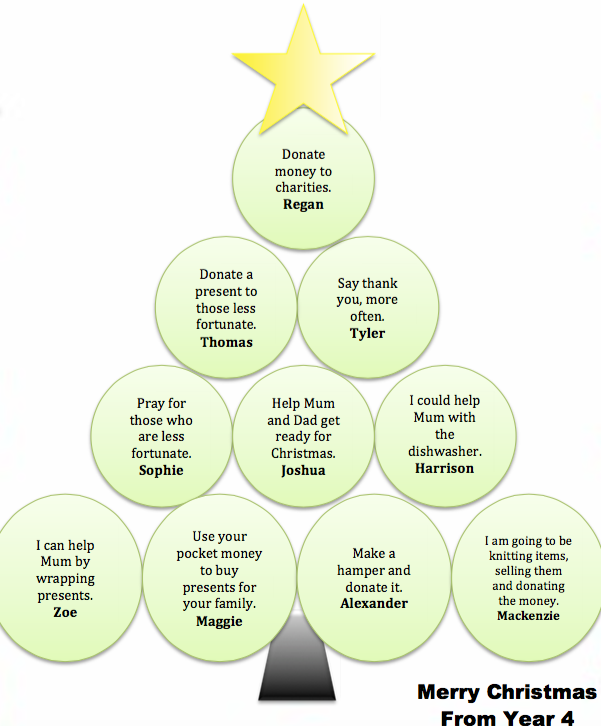 Year 4 has been focusing on how we can help others this Advent. Here are some of our ideas. Congratulations to the students who have received Nano Rewards this week. Thank you to all the families who have settled their accounts. For any that remain outstanding, I ask that they be finalised prior to 3:00pm on Thursday 17 December 2015. A special thank you to all of the Uniform shop and Canteen volunteers for helping out during 2015. There will be no school banking next week. The first meeting of the P&F will be held Monday 15 February 2016 at 7:00pm in the Library. All welcome to attend. The last of our seeds were sold this week - we look forward to seeing an amazing display of pumpkins at the Fair. Final Tips : Don’t forget to use the liquid fertiliser after 2 weeks of sprouting. Grade 3 parents are sourcing some great vouchers as prizes for the winning pumpkins to reward families for their hard work over the holidays. Thanks again to Bunnings Warehouse, 20 Howard Road Glenorchy for donating the seeds. The Fair Committee would like to thank the school community for the grocery items received. Thank you very much. The Fair will once again display entries in the Fair Photo Competiton. The theme this year will be “Summer / Holidays”. Photos are to be taken by the entrant. This is a great project for the Summer break and we are looking for photos that capture the essence of holidays. Friends, family and outdoor fun! This is not only a prestigious prize the Fair Committee hope to award some great prizes too. We have a few places left to offer a parent/guardian of the school the opportunity to host a stall at our School Fair. If you are interested please apply by the end of Term 4 (Thursday 17 December). The Fair Committee will work very hard during January to finalise donations and details for the Fair. Raffle tickets will go home the first week of Term 1, 2016 and will need to be sold in February. Parents / Guardians will be required for help on stalls in 1 hour blocks – 4.30pm – 7.30pm. A Fair Volunteer Form will go out and give people the option to advise areas they would prefer to help and choices of times they are available. Finally, look for the Fair Facebook event page or email any queries to the Committee at ccs.fair@corpuschristi.tas.edu.au. Finally, the P&F wish families a very merry Christmas and safe and relaxing holiday break ready for a great year in 2016. STAR WARS EPISODE VII – LAST CHANCE FOR TICKETS! Catholic Youth Ministry’s special fundraising screening of the brand new and highly anticipated Star Wars Episode VII: The Force Awakens is happening very soon! Please get all your friends and family together to join us on Opening Night of the film, Thursday 17 th December at Village Cinemas at either Launceston or Eastlands (take your pick!). Funds raised will support our young Tasmanians headed to World Youth Day 2016 Krakow. Tickets are $30 and include small popcorn and 600ml drink. There will be give-aways and a prize for the best-dressed! So come dressed for the occasion. You must pre-purchase your tickets. Book your tickets online ASAP (if you haven’t already) at: www.trybooking.com/JHYV or contact Rachelle on 0400 045 368. Once again, Bricks 4 Kidz® is holding half day and full day LEGO® workshops these school holidays. Themes in January include Mining and Crafting, Space Adventures, Minion Madness, Bricks City, A Magical Freezing Kingdom, Amusement Park Mayhem and more! There is also a special Christmas themed one on Friday 18 December. Come and have fun building LEGO® using our own plans with a variety of different activities including using Technic LEGO® with motors and batteries! Locations are Lenah Valley, Howrah and Taroona. Visit our website: www.bricks4kidzaustralia.com.au/tasmania-hobart/ or phone 0408 454 851 for details. Why not book in for our January Holiday Music Classes? for Beginner, or Continuation (ages 5+). Classes run 45min each day, subject to numbers. Cost: $80/wk including resources for Intro classes.